Hint- it’s not from Time Warner, it’s not from AT&T and it’s not Cincinnati Bell (they use AT&T’s pipes). In Dayton- the city- you can’t and won’t get fiber from any of the standard providers. T-1’s and fractionals are expensive. DSL is dog slow. And you can’t get real upload speeds from cable. What’s a small tech firm to do? Call Norm Wentland at Dayton Digital Development (937) 371-3192- and hope and pray you can get an antenna outside your building that can go line of sight to Downtown. Norm is running a peer to peer network over radio waves- and will give you a fixed IP and at least 8Mbs symmetrically up and down for $100 a month. 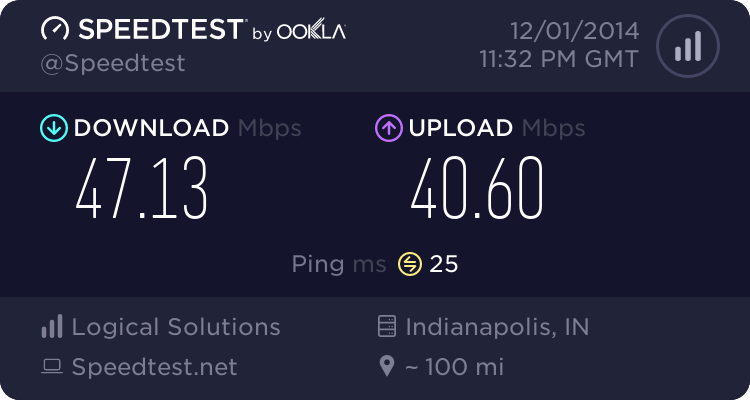 Yes- the ping is high – most of the time it’s around 19- but the download is a good 10mbs faster than what Time Warner does on downloads and the upload is 6x faster. Finally- uploading video to YouTube won’t take an entire weekend. My client at the Dayton Mall with the 3d scans and prints- is struggling with the DSL that’s available there from AT&T. He needs at least 5MBS up- and they are only able to deliver about half that. How are we supposed to attract business with our water, when our internet flows like frozen molasses? Why are we building parking garages for real estate developers on Water Street when we should be building internet infrastructure for online businesses everywhere? This is the infrastructure of the future- who will need a parking garage after Google perfects the self driving car? Watching the people from Miller Pipeline destroy South Park streets to put in new gas lines- I’m wondering why we haven’t demanded that all new utility work includes adding fiber to the home? Why should we have to dig everything up again? Unfortunately our digitally delayed politicians have no clue how important basic internet connectivity is. I posted this on Facebook this morning and already a friend has called Norm. I’ve known about this technology and Norm for years- I’m not sure why I suffered slow internet for so long. Say good bye to the telco and cable crooks- and get your business up on the fast track. And as a side note- almost all of TW cable and internet was out most of today in South Park because it was windy. Why do we allow ourselves to live in third world internet land? When Estonia and Vietnam are almost entirely covered by WiFi- and S. Korea has access speeds 20x faster than us, our leadership should have some explaining to do. In the meantime- you can call Norm.